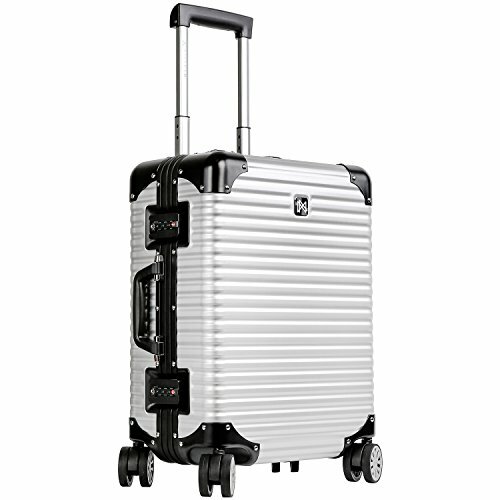 The LANZZO Suitcase is constructed from a special aircraft grade aluminum-magnesium alloy to make it super lightweight with outstanding impact strength and superior stability. The combination of the bright body and black tough wrap gives this case a stylish, yet functional look. This suitcase has a convenient book-like divider to easily organize and separate your belongings. The innovative silent spinner with multi-directional capability and telescoping handle provide you with convenience and optimal maneuverability when rolling the bag. For extra safety, a TSA-approved lock is provided for easy security checks. A unique ID number is provided along with a five year global warranty service. No matter if you are traveling domestically, or internationally, this sleek suitcase will be the ideal travel companion. No matter if you are traveling domestically, or internationally, this sleek suitcase will be the ideal travel companion. LANZZO is a fashion brand from Italy that is devoted to the design and manufacture of suitcases and luggage. We strive to keep designs simple and streamlined to provide customers with the most enjoyable, fashionable, lightweight luggage. LANZZO seeks to overthrow the old-fashioned materials and stereotyped design in the conventional & monotonous luggage industry, keep challenging all aspects of limits in the material, process and design etc., aiming to create the luggage for "happy tour where I am the splendid scenery of the world." If you have any questions about this product by LANZZO, contact us by completing and submitting the form below. If you are looking for a specif part number, please include it with your message.